What seems to be like another typical slice of life anime turned out to be an excellent and refreshing anime to enjoy. I loved every single moment of Aria the Animation and it's cheerful and happy environment that it radiates. It is a simply wonderful and beautifully illustrated anime. Drift peacefully into Neo Venezia, a city on the planet Aqua (formerly known as Mars). By the 24th century, humans have found a way to colonize the previously uninhabitable planet. As futuristic as that sounds, Neo Venezia is still teeming with rustic beauty; gondolas on wide canals and waterways are the main mode of transportation. The city itself is a faithful replication of Manhome’s (the planet formerly known as Earth) Venice. To make sure that residents and tourists alike get the most from Neo Venezia’s many wonders, companies offering guided tours via gondola were formed, one of which is named Aria Company. This is the workplace of Akari Mizunashi, a free spirited teenager from Manhome who is now a novice Undine (the title given to tour guides). Join Akari as she becomes intimately acquainted with other Undine, tourists, Neo Venezia’s residents, and even the city itself, learning many valuable life lessons along the way, such as the wonderful truth that there are such things as manmade miracles. So, like me, you would prejudge the anime before watching it. 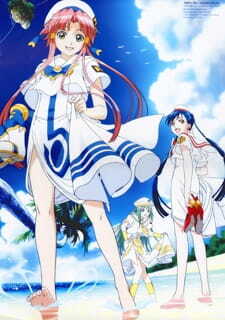 Take a look at Aria the Animation. Strictly G-rated and is a pure slice of life anime with no action, drama, or fast-paced scenes. It is all calm and relaxing. You may think, how will this anime entertain me? How will it keep me occupied? Well, once you start drifting along with the pace you surely will thoroughly enjoy this anime. To fully appreciate the calmness and wonder of this anime, you need to find a nice quiet spot to relax, grab a coffee, your favourite soft toy and simply start watching this anime. Perfect for rainy days or when you are alone at home. So what is Aria the Animation about? Well, simply put, it is a story about three teenagers working as novice Undines and their everyday lives' dealing with customers, visitors, and their mentors to experiencing wonders of the city of Neo Venezia. Every episode is filled with enjoyment, adventure, and some funny moments. This is truly a relaxing and innocent anime to enjoy. The art was beautiful and spectacular in every way. The city looked great and the water was always sparkling. The characters were superbly detailed and they all looked unique and elegant. The art style in this anime somehow gives off a pleasing aura and wonder that is portrayed in the fictional city of Neo Venezia. Perhaps its the bright colours of the backgrounds to the wonderful costumes that the Undines wear. Whatever it is, it is surely captivating. It was a marvellous experience just listening to the calm, slow-moving music that the anime has to offer. The opening and ending theme songs were beautifully composed and very catchy indeed. Throughout the anime, you will hear the pleasant sounds of everyday life in Neo Venezia accompanied by soft, slow strumming of a melodious guitar that will surely relax your mind and body. It's like floating on a inflatable beach floats drifting calmly on the water whilst relaxing music is playing. Yes, this is how I would describe the soundtrack of Aria the Animation. For a slice of life anime, characters are the most important aspect you want to solely focus on. Here, Aria the Animation successfully establishes many characters that we come to love in the end. Akari is the naive and kind girl who always helps a friend in need. She is cute and funny. She encounters Aika; an outgoing peppy girl, and Alice; a quiet shy girl. Accompanying them are their mentors; Alicia (Aria Company), Akira (Himeya), and Athena (Orange Planet) respectively also with their mascots; Aria, Himeya, and Maa. That is not all, other characters appear in the anime with many of their names starting with 'A'. Up until the last episodes was I still confused between the character's names since they mostly all start with 'A'. It is quite confusing indeed when 'Akari' and 'Akira' is mentioned in the same sentence. In the end, I finally got to know all the characters and their respective names. I must say; this has been one enjoyable and relaxing anime to watch. I loved every bit of it and the mysterious city of Neo Venezia. I was captivated by the melodious music and the charming characters that this city holds. It's almost like I'm in a sweet dream. To end it all is simply like waking up from this dream and realizing that you are back in the real world. It's like going on a holiday to a tropical island where everyday is sunny and you are on the beach drinking coconut juice. Anyhow, I have a warning. This anime will put you to sleep; not because that it is so boring, but because it is is just so damn relaxing and calm! I finally understand why this anime has captivated many other viewers like myself after watching the first few episodes. There is very little excitement or action, it is just a wonderful and magical experience. My heart would probably burt from the extreme happiness, sweetness, colourfulness, cuteness, niceness, fluffiness, and whatever else makes you happy. Yes, I do sound gay; but that is what this anime brings out from within you- your happy side. Not much of a story here except the lives of these three girls and their adventures of Neo Venezia on gondolas. Just simply amazing and stunning. Characters all looked elegant and detailed. The backgrounds in this anime were quite beautifully illustrated. I totally loved the music throughout this anime. Voice acting was superb. The characters were pretty cute and were funny in various ways. They all had unique personalities. So enjoyable that I fell asleep from the pure relaxing mood this anime radiates. For some reason, I just kept coming back, wanting for more of this relaxing story. Perfect for rainy days or when you are alone by yourself.